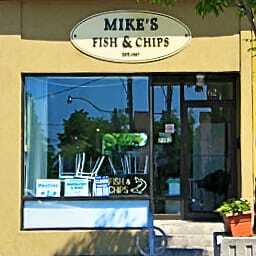 I pass by Mike’s Fish & Chips all the time on my way to Woodbine subway station – it’s a short walk from my house. But surprisingly, I’ve only eaten there twice. My first visit to Mike’s Fish & chips was a little over a year ago when Michelle and I went in for their $3.95 burger and fries special. It was cheap in price but the ingredients were notably fresh and the fries left quite the impression on me – so good! The fries were as good as I remember – I wish I knew what it was that makes these fries so good, but I can’t put my finger on it. Maybe it’s the kind of potatoes they use? As for the fish (halibut) it wasn’t as good as the fish I had farther east on the Danforth at Len Duckworth’s, but it was still a decent piece of fish and it rescued my stomach from the atrocity I was served at Relish just moments prior. In comparison to Len Duckworth’s, the portion of fish here was quite smaller – maybe not in physical dimensions, but definitely in thickness. And the batter didn’t stick to the fish very well, so eating it with my hands resulted in a lot of pieces of batter scattered across my plate… But it was still a very tasty piece of fried fish nonetheless. it’s the fries at Mike’s Fish & Chips that will likely have you coming back for more though. I also couldn’t help but notice how many pick-up orders they had for poutine in the short time I was there… Oh, and I also saw that they make a really good Greek salad there as well (the owners are Greek) and I’m looking forward to going back and giving that a try next time. If you’re in the area and looking for a quick (and cheap) bite to eat, definitely check out Mike’s Fish & Chips, and for goodness sake, try the fries! 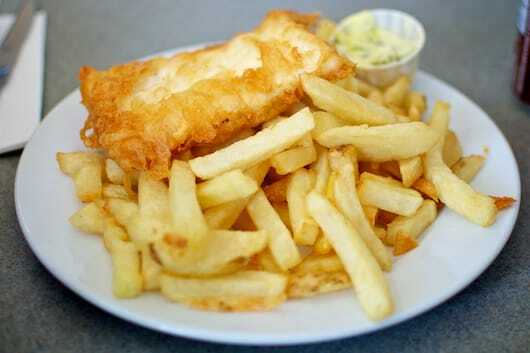 Mike’s Fish & Chips was published on Tuesday, September 20, 2011 at 12:27pm EDT by Daniel Menjívar and last updated on April 11, 2018 at 9:30pm UTC .